The Global CCS Institute presents the first detailed report on CO2 pipeline design for Australia. This comprehensive investigation provides a critical review of current Australian and global pipeline design standards for CO2 transport. 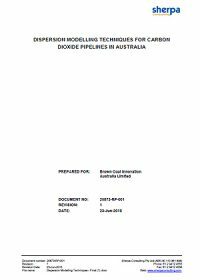 The report provides insight into the current Australian Standards for Pipeline Design, AS2885 and undertaking fit-for-purpose dispersion modeling for CO2 detailing a set of guidelines and best practice recommendations. The report was prepared for Brown Coal Innovation by Sherpa Consulting and funded by the Australian National Low Emissions Coal Research and Development Ltd (ANLEC R&D) and the Department of Economic Development, Jobs, Transport, and Resources of the State of Victoria, administered through Brown Coal Innovation Australia Limited and is part of the series of reports focussing on CCS in Victoria. Chris Consoli, Institute Senior Adviser for Storage, Asia-Pacific also provides an overview of the report in an Insight available on the Global CCS Institute website. This report is republished with the permission of The CarbonNet Project. It was funded in part by a contribution by the Global CCS Institute, commissioned within the scope of The CarbonNet Project and in line with The Institute's mission to accelerate the development, demonstration and deployment of carbon capture and storage globally. The views expressed within the report are those of the authors and not necessarily of the Global CCS Institute.